Huey with a Broken "Leg"
Once again the Military Assistance Command Vietnam (MACV) attempted to provide a hot Christmas dinner for all troops throughout Vietnam whether they be in the field or in established mess halls. 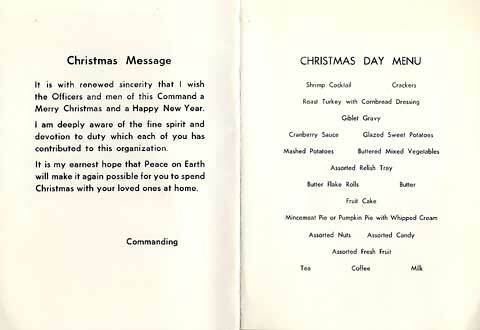 As seen by the specially prepared menus below which was used by units within the 145th Combat Aviation Battalion (CAB), the meal was as close to "home" as possible with all the trimmings. General William C. Westmoreland even had a short message to the men. 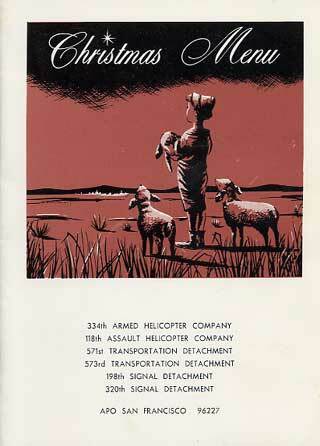 Thanks to Willis Long for providing these scanned copies of the menu he kept as a remembrance of his tour in Vietnam in 1966-67 with the 118th Assault Helicopter Company. The Vietnamese Air Force (VNAF) pilots began training to fly the CH-34 helicopter back in the USA in the very early 60's. They usually attended Primary Helicopter training at Mineral Wells, TX as one or two added students to each flight class. 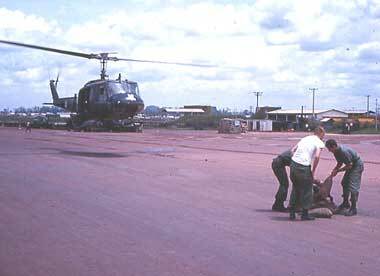 After flying in Vietnam for several years, most of them needed to be transitioned into the UH-1D and H model Hueys in anticipation of the VNAF phasing out the H-34s and receiving their own Hueys. To accomplish this transition the VNAF pilots were sent to many of the US helicopter units to get approximately 100 hours in 90 days from the U. S. pilots. 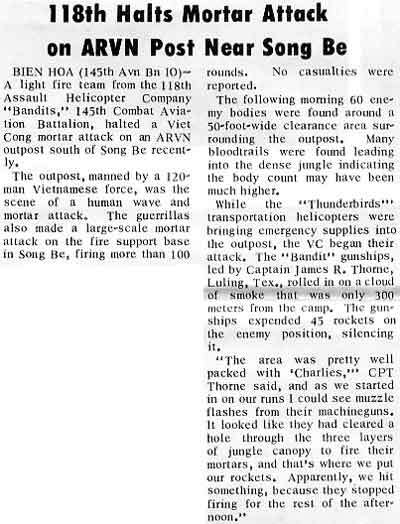 This article from Dec 26, 1966 in "The Observer" shows how one LT Nugyen Duy The flew with the 118th Thunderbirds and in particular with LT Thomas H. Payne. 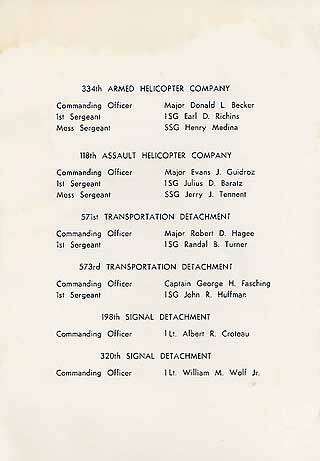 These "students" flew with many of the 118th pilots in order to receive instruction and guidance in flying the UH-1D & H. Obviously, they knew the terrain and country and were many times an asset to the aircrew. 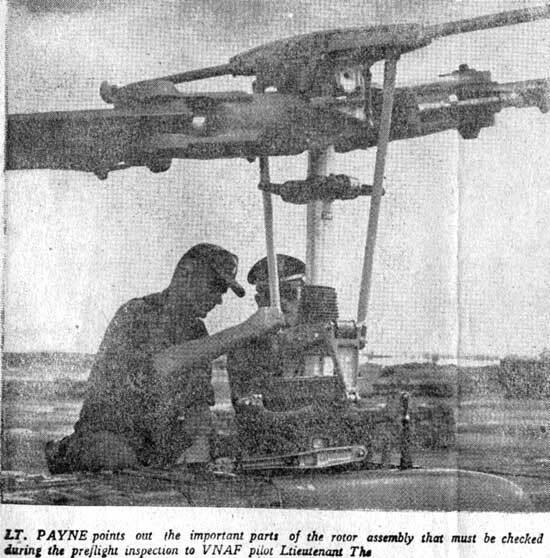 Thomas Payne remembers, "Most of them were already pretty good pilots, in their own right, but were in need of training in combat assaults and helicopter tactics. I flew a lot with LT The and learned to trust him completely as he learned how to handle the UH-1D in every kind of situation." One of the most horrible happenings of war is what is called "friendly fire." 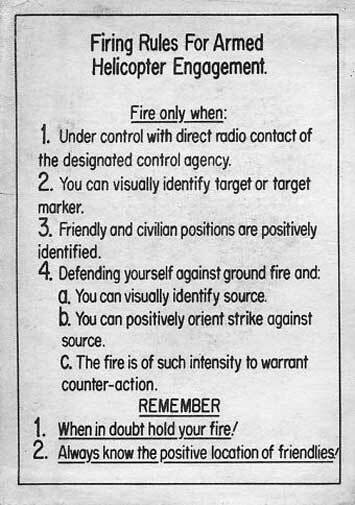 At all costs, friendly fire is avoided and great efforts are taken to see that it doesn't happen. In Vietnam, if friendly fire happened, it was usually because poor coordination between ground troops and helicopters or airplanes in the air. 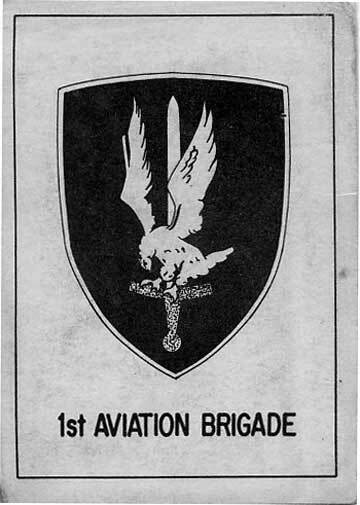 In an effort to reduce the happening of friendly fire, the 1st Aviation Brigade issued a little card for all air crews to carry as a reminder. 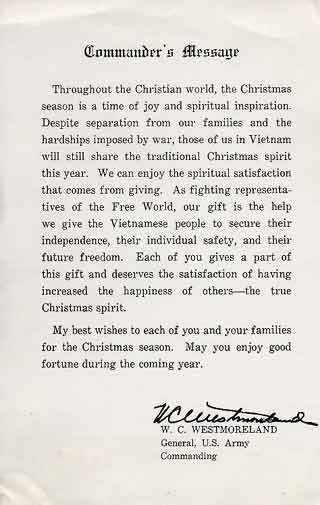 Below is the card as it appeared in the 1967 time. 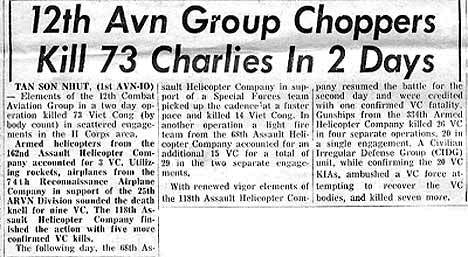 118th AHC armed helicopters in the "Army Reporter". Article above appeared in "Army Reporter" in early 1968. 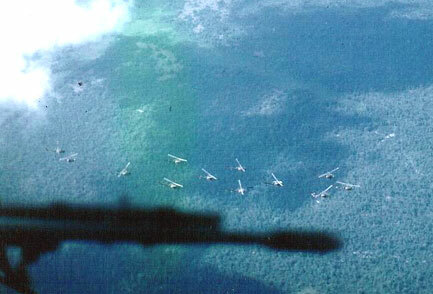 Formation flying is a tactic of warfare that dates back centuries. Even foot soldiers in B.C. times understood the purpose of "formations" and "massing" as used in warfare and the successes it would bring if properly executed. Formations were used by organized armies to assault and ultimately defeat an enemy of less disciplined foes on the battle field. 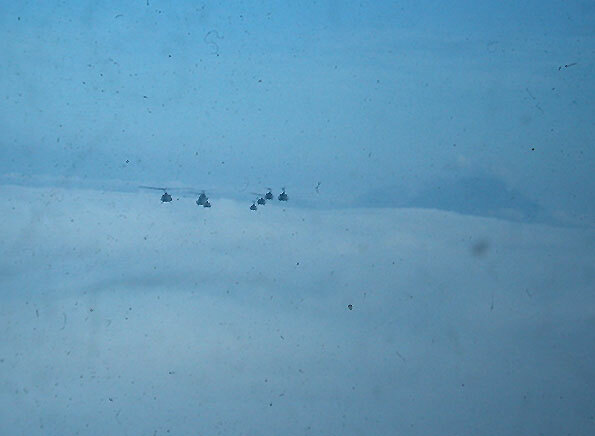 In the case of aerial flight of airplanes and helicopters, formations have been used for several purposes. First is the orderly and quick movement of aircraft from one point to another. Second, is the massing of fires from the individual aircraft as both a defensive and offensive tactic against the enemy. 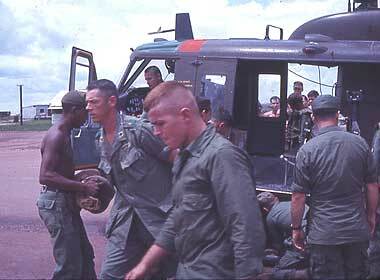 And, in the case of helicopters, the landing of the troops on the battlefield in such a manner that they are organized and coordinated (versus airborne drops) during the early moments when they begin to engage the enemy on the ground. 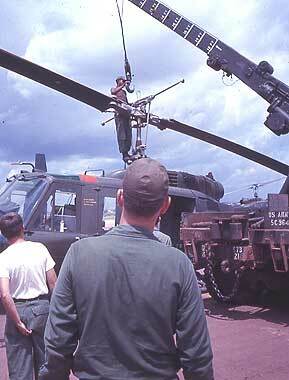 In Vietnam was the first time such heliborne tactics were used in the US Army. 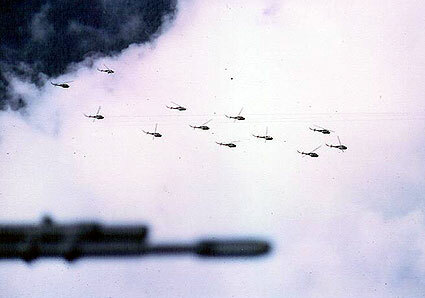 Pioneered by the Howze Board in 1963, the helicopter units in Vietnam perfected the tactic of formation flying to a very high level. All units took extreme pride in their ability to accomplish formation flying with precision and effectiveness against the Viet Cong. From their very beginning the 118th Thunderbirds were highly skilled and highly motivated in formation flying. 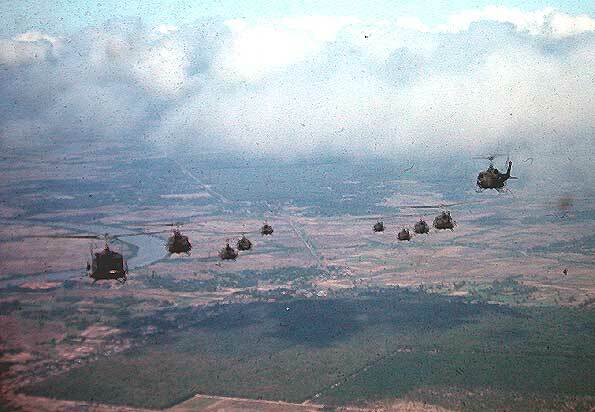 Beginning in the early years of 1962-63 the pilots of the CH-21's relished the opportunity and challenge of flying in formation on combat assaults and combat extractions. Their massed door guns and later the Bandit gun ships accomplished many lifts which would have been disasters had not good and proficient formation flying been possible. 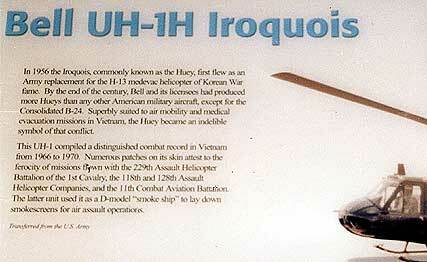 Below is several photos from the 1964 time period when the Thunderbirds had their early UH-1B's. The photos were taken from a supporting Bandit gun ship from above and below the formation. The formation in all the photos was "V's of three". This formation was very often used for most lifts. Also favored was V's of 5's and staggered right or left. More photos will be added as they become available to show other formations used by the 118th Thunderbirds during their almost 9 years in Vietnam. 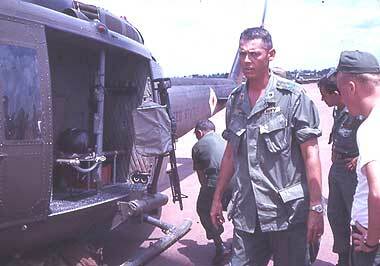 Carrying the loads that Huey's often did while taking off from rice paddies, rice dikes, roads and airfields covered with PSP, was always a matter of proper technique. 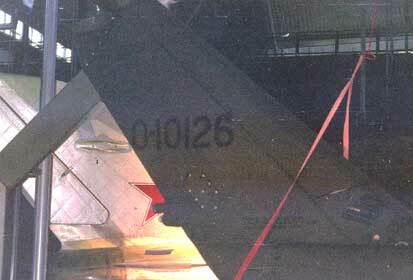 Dust was hardly ever a factor in making a successful take-off in Vietnam. However, taking off with a very heavily loaded gun ship or slick over rice paddies full of water could easily cause a loss of ground cushion and the accompanying large loss of RPM. 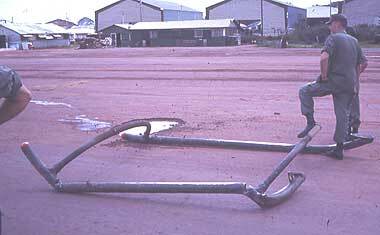 When this happened, it was not unusual to "bounce" off the ground or slide the skids causing sparks and skid shoes to wear! Maintenance was not very happy when this happened. Occasionally, technique would not be sufficient and a strange and a potentially lethal situation would happen. 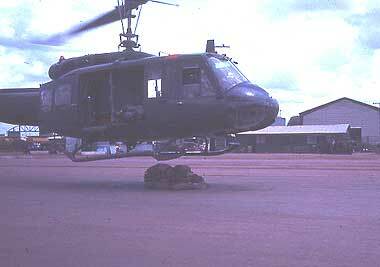 Such was the case with this story about a Huey with a broken "Leg". 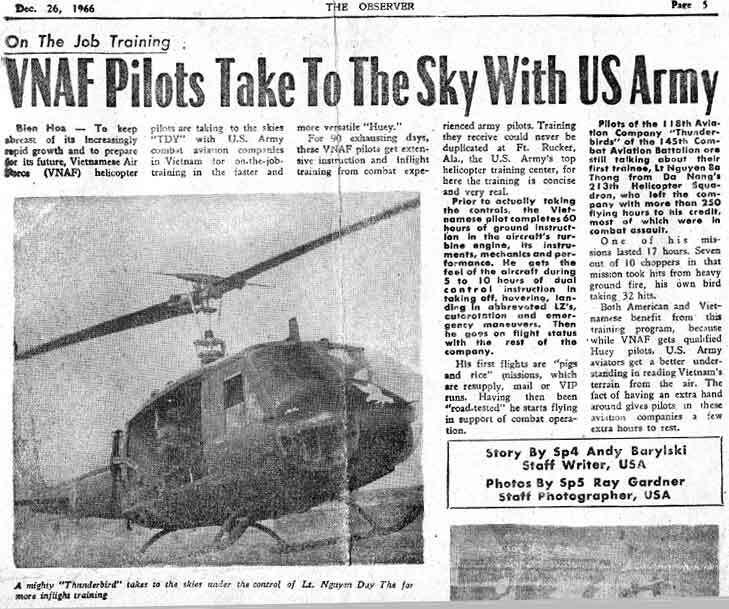 MAJ Donald Wray, Bird watcher 6 and CO of the 573rd Maintenance Detachment remembered the incident this way: "As I recall, the aircraft was taking off from an old airstrip or landing pad that was covered with PSP. Somehow, the rotor wash lifted a pretty good section of the PSP (which apparently wasn't well secured to the ground), and during the take off the skids got caught on it. They were able to complete the takeoff, but the skids were almost ripped off. The guys were lucky they weren't snatched out of the sky! 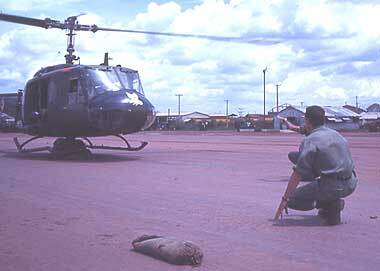 The crew radioed ahead to Bien Hoa and when they got back to the Birdcage, our guys looked at the damage to see if a temporary repair could be made while in a low hover, and then land on the skids. That was not an option. That's when we made the bed of sandbags and the crew gently set the aircraft down on them with minimal additional damage. They did a great job." The photos below show in sequence the great job done by the pilots and crew of Red bird 2 to land and stabilize the aircraft on a pad of sandbags. All the photos were provided by Willis Long who was there and took them at the time. After an inspection a decision has been made. Maintenance guys carry sandbags and make a cradle. laying on floor and giving guidance to pilot. All crew members are still on board! Descending to the sandbag cradle. 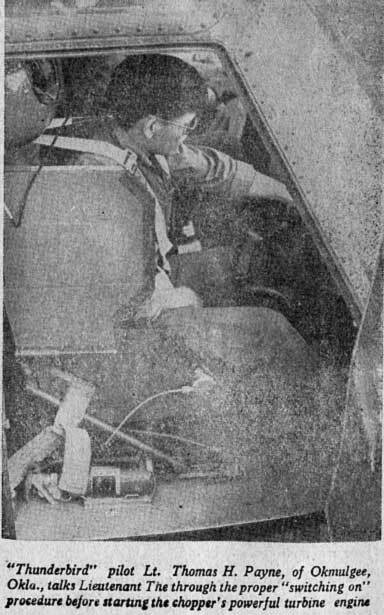 MAJ Donald Wray giving hand signals to the pilot. held light on the skids, all crew jump out. Aircraft has been shut down and pilots get out. MAJ Wray with a little "worry" on his face. as they were dragged and piled up. Once again many thanks to Willis Long who worked in the 573rd Maintenance Detachment at the time for providing these great photos of the incident. The intent of this piece is not to embarrass any one. 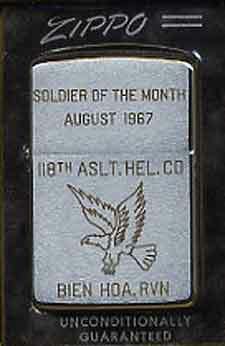 However, the Enlisted ranks have a time honored tradition of "Soldier of the Month". A command from company level up to division selects a "Soldier of the Month" as a way of recognizing a person who has done a superior job and has exemplified what an outstanding soldier should be like. Recognition was normally by a formal letter of commendation, placed in the soldier's personnel file and a small token of remembrance for the occasion. Most times this token was a plaque, framed photo or even a cigarette lighter. The 33rd/118th Thunderbirds regularly participated in this tradition. 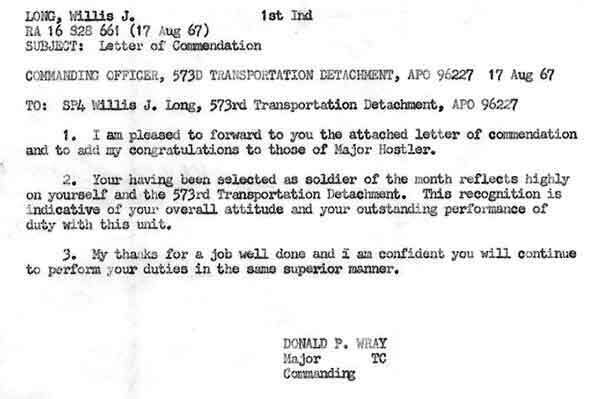 Below is an example of one man who was selected as "Soldier of the Month" in August 1967, SP4 Willis J. Long. Now the selection of "Soldier of the Month" took place each and every month that the Thunderbirds were in Vietnam. But remember, they were in Vietnam for almost 9 years. This means that approximately 100 men received this honor. If anyone has knowledge of others who who were selected, and their month of selection, contact the Webmaster and their names will be added to the list below. 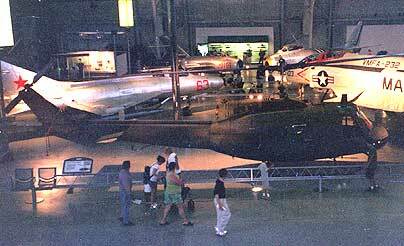 Not many aircraft in American history get a permanent place to be displayed at the Smithsonian Air & Space Museum in Washington D.C. One of the few helicopters, and one of only a handfull from the Vietnam era, is on display at the relatively new Steven F. Udvar-Hazy Center at Dulles Int'l Airport. 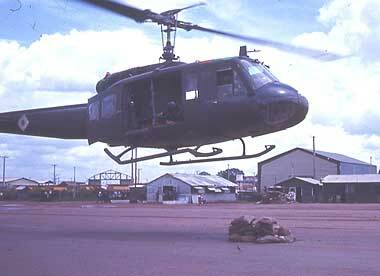 This "Huey" was last flown in the 118th Thunderbirds from October 1969 to April 1970 before being returned to the U.S. where it served with various National Guard units until 1976. 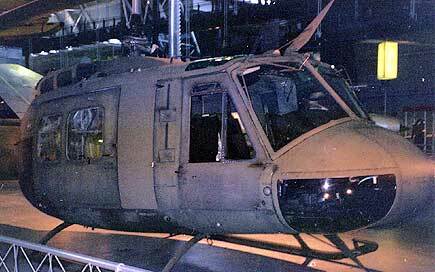 The National Air and Space Museum acquired this UH-1H Huey in 1995. 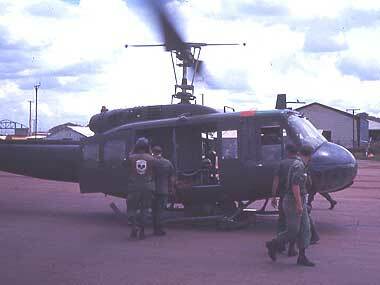 This aircraft, U.S. Army serial number 65-10126, began its military career as a brand new UH-1D accepted by the Army in October 1966. 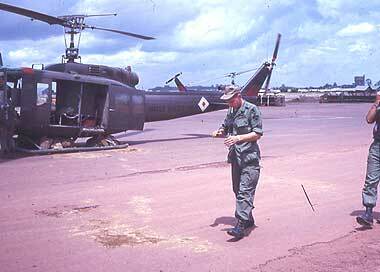 One month later, 65-10126 was flying in Vietnam with Company A of the 229th Aviation Battalion, 1st Cavalry Division. 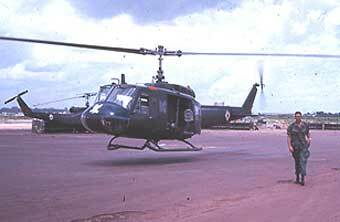 It remained in Company A for ten months before the Army transferred the helicopter to Headquarters Company, 11th Aviation Battalion, where it served through June 1968 as Smokey III, a name given to the aircraft by its crew. 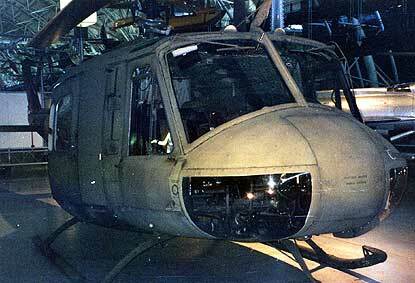 These particular Hueys were fitted with a device that produced dense smoke by spraying oil into the exhaust system. 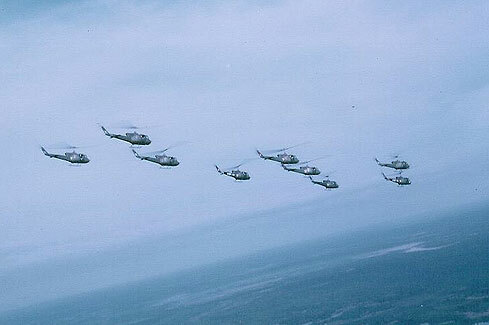 The smoke screened friendly helicopters from the enemy. For example, as troop transports approached an LZ, a Smokey would fly very low, producing smoke, between the LZ and known or suspected enemy positions. The operation worked best when the smoke was deployed low and slow. This made flying the smoke ships an especially risky mission.